After Stana Katic’s departure from Castle, many wondered what Nathan Fillion would do next. The answer is a new ABC series featured the former Firefly in a new role as middle-aged rookie cop trying to find a new career for himself with the Los Angeles Police Department. The Rookie is based on the true story of John Nolan, the LAPD’s oldest rookie who cast aside his comfortable small town life and moved to L.A. to pursue his dream of become a police office. Just like the real life Nolan, Fillion’s version of the character finds himself surrounded by rookies who are twenty years younger than him. One of the reasons why I was particularly excited about this show is because it features Melissa O’Neil. I first met Melissa in 2005 when she participated in the Canadian reality series and ended up winning the show. At the time, I interviewed her several times. 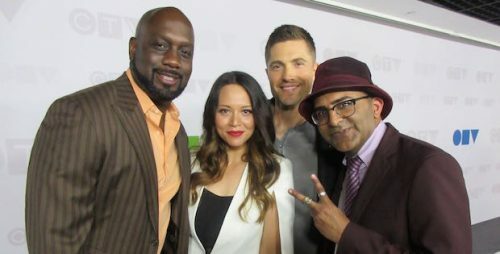 At CTV’s 2018 upfront presentation, I caught up with Melissa O’Neil alongside her Rookie co-stars, Richard T. Jones and Eric Winter. It was my first time interviewing her in 13 years. We chatted about how she was able to successfully make the transition to acting. I asked Richard about his character on the series and why his character on the series seems to clash with Nathan Fillion’s John Nolan so much. I also talked to the cast about the buzz the show has received given that it is Fillion’s first show since Castle and Eric Winter opened up about why he thinks the series will resonate with audiences. The Rookie airs Tuesdays at 10 p.m. on CTV.